On Friday I talked with a physicist who does single-molecule studies on DNA helicases, using a magnetic trap system. He gave me lots of good ideas about the physics of DNA uptake. He thought that kinking of intact double-stranded DNA was indeed physically difficult, perhaps more difficult than I had realized, and suggested that instead one strand of the DNA might be nicked at the USS to facilitate kinking and thus passage of the molecule through the narrow secretin pore. 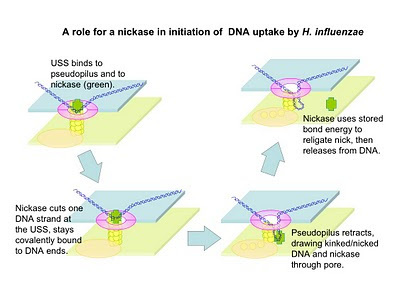 He thought that a (hypothetical) nickase might be small enough to pass through the pore along with the nicked/kinked DNA, at least if the pseudopilus wasn't still filling the pore. This would let the nickase remain covalently attached to the ends it had created (as topoisomerases do), and let it use stored bond energy (from the bond it broke) to reseal the nick in the periplasm. I said that resealing shouldn't be needed, but he thought that resealing (reversing the nicking reaction) might be the only way that the nickase could release the DNA. Resealing would also explain how the levels of supercoiling might be preserved, as was seen for some lightly supercoliled plasmids*. I told him about the postulated secreted ligase in the competence regulon, and he thought this was a reasonable candidate for a nickase. One thing we need to do is carefully measure the uptake of plasmids with known amounts of supercoiling, looking for any evidence that supercoiling changes. Another is to make our own knockout of the periplasmic ligase and carefully test uptake of linear and supercoiled DNAs. And another is to test whether artificially nicking a plasmid stimulates uptake in the same way that an uptake sequence does. He also suggested that 'tethered particle motion' analysis might be useful for investigating uptake. We would attach a bead to one end of a DNA fragment that had a single USS in a defined position (we already have this construct) and incubate this with competent cells attached to a cover slip. With suitable hardware and software, the position of the tethered bead in the x and y dimensions can be precisely monitored. If there is binding/initiation but no ongoing uptake of DNA, the bead will wander through a hemisphere whose center is the cell and whose radius is the length of the DNA from the point of binding/initiation. If the cell is taking up DNA, the radius will get progressively smaller. Tethered particle analysis is supposed to be a lot less fussy than optical tweezers work. I'll have to think about what we might learn from it, and find out whether my sabbatical physics lab has the setup. * A new thought about the experiment where supercoiling was preserved: The plasmids in question weren't really significantly supercoiled - their supercoiling levels were just what's trapped when linear DNA fragments are ligated into covalently closed circles. So the observation that the plasmid pool had the same distribution of supercoiling after uptake as before might just be because the plasmids were cut and then religated, again trapping random supercoils in the same proportions as before.